Take good care of your customer or someone else will! At least 111 people in seven states - 64 of them in New York City - have been sickened by the overuse or misuse of common pesticides against bedbugs over the last eight years, the federal Centers for Disease Control and Prevention said. One person who became ill, a woman in North Carolina, died after dousing her home and herself with pesticides. Anderson's Pest Pros specializes in bed bug control and removal in homes and in the hospitality industry. If you try to kill bed bugs in your home it could lead to health problems or even death! Let us help! We are trained experts in resolving any bed bug infestations. We do it right the first time! 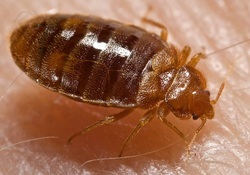 Bed bugs have changed the hospitality industries within the last 10 years. Anderson's Pest Pros have been able to turn hotels around with major bed bug problems. There are many pest control companies out there who do not invest the time and effort to make sure the problem has been taken care of correctly. do bed bugs put my health at risk? Bed bug bites are a nuisance and annoying, but bed bugs are not known to spread diseases. Try not to scratch bites because it increases the risk of skin infections. If you have a severe reaction to a bed bug bite, see your doctor. Be aware that other insects, such as fleas, ticks, and mosquitos, can leave bites that look like bed bug bites. Bites alone cannot prove you have a bed bug infestation. Important note: The only way to be sure you have a bed bug infestation is to find and positively identify a live bed bug. Save a live bug sample in a zip-type sandwich bag. Coax the bug into a bag, gently flatten the bag to press out the air, and seal it completely. Have the sample inspected and the type of bug positively identified by a pest control operator. If you find bugs that do not look similar, save samples of the different bugs in separate bags. There may be bed bugs at different life stages, or there may be different types of bugs. The method of pest treatment will depends on what type of bug is present. A pest control operator will correctly identify the type of pest(s) present before they recommend a method of treatment. Should i apply pesticides myself? NO. General use or 'over the counter' pesticides are not effective in killing or eliminating bed bugs. Even pesticides available only to licensed professionals have limited effectiveness. Bed bugs have developed resistance to certain pesticides. Using pesticides incorrectly can make the problem worse by causing insects to scatter and move into walls, hard to reach places and other parts of the home. Do not use bug bombs or foggers - they do not work against bed bugs and spread hazardous chemicals throughout your home. For more information on bed bugs, check out this really nice article by Michael F. Potter, Extension Entomologist with the University of Kentucky College of Agriculture.